Derek Hulak with the helmet sticker to honor his former teammate. Derek Hulak had two goals, and Jussi Rynnas pitched a 34-save shutout for the Texas Stars tonight as they beat the visiting Checkers 4-0. With the win, Texas has now collected 7 of 8 points on their current homestand. Hulak had a little extra motivation tonight as he was wearing a small sticker on the back-left of his helmet in unity with members of his collegiate team who are raising money for a teammate affected by cancer. Cody Smuk, who grew up on the same street as Hulak and played with him through four years of CIS hockey, was in Hulak's thoughts tonight. "I couldn't be [in Saskatchewan] for one of my friends going through that battle," said Hulak. "So I asked if I could put that sticker as a memento to let him know I'm thinking about him. Our trainer told me just before the game today. For me, that was a big confidence boost." Hulak had the game's opening goal, a huge momentum boost for the club, which rained 19 shots on Drew MacIntyre on the first period but was stymied through much of the frame. "It was huge for us to get that first goal and that momentum, that confidence in our building," added Coach Laxdal. Texas's 19-shot first would be topped by their 20-shot third period. In all, the Stars bombed Drew MacIntyre with 50 shots. "We tried to create more of a shot mentality," Laxdal expanded. "MacIntyre is a heck of a goaltender, so we wanted to generate those second-chance opportunities." Hulak's second goal of the night, and third overall for the Stars, came on one of those second-chance opportunities. "Lucky bounce to put the puck on my stick," said Hulak, who then prceeded to wait with the patient of a monk for MacIntyre to make a move. "I just tried waiting him out and luckily he went down." The battle at the net was fierce on both sides tonight. 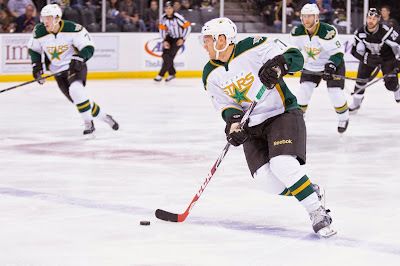 Jussi Rynnas kept Texas in the game through a shaky second period that saw Charlotte outshoot the Stars 13-11. Laxdal quipped, "He earned the shutout. In the second period, he made some Grade A saves. The win was good for him and his confidence." The shutout was made stronger by the addition of two penalty shots against Rynnas, both of which he stopped, one in the first and one in the third. Texas had enough goal-scoring to go around in the game, four in total. Derek Meech helped solidify the momentum from the first period with a rainbow goal shot in from the point, almost as an afterthought. It befuddled MacIntyre and gave Texas the 2-0 lead. In the third, Branden Troock added the Stars final goal of the game as he picked the top left corner for his second of the year. Gemel Smith and Jesse Root assisted on the play. As the game appeared out of hand, the Checkers got frustrated, and things got physical. The officiating, which had been questionable all night, put its foot down in the final five minutes, assessing Troock a misconduct and Stransky a minor, both apparently for not-so-kind criticism of the officiating. And in a stat line you are unlikely to see ever again in Texas Stars history, rookie Finnish defenseman Julius Honka was assessed a fighting major after he was dragged into a fight with Patrick Brown. The Stars stay in town to face San Antonio and close the home stand on Tuesday. The homestand continues for Texas with the most beatable opponent of the five games they will play in this stretch. Charlotte has been in the bottom three of the standings all season and, despite a 5-4-2 run over the last ten games, is still in 13th place. Texas got a rare Friday night off after playing on Thursday at home. The Checkers come to town having played the same opponent as the Stars did in their last game, the Rampage. Texas has a chance here to catch the Checkers without playing a second game the day after. That has been a troubling point for the Stars all year against many teams, but especially against Charlotte. In back-to-back games against Charlotte this year, the Stars have won each of the first games and lost each of the second. The only game that stands alone, their December 27th contest at the CPC, was a 4-2 Texas win. The Stars hope for a similar occurrence this evening. Top D-man Ryan Murphy is out for the Checkers, having been called up to Carolina. Note the later than usual start time due to changeover from the Austin Spurs game this afternoon at 1 PM. Ice quality will be something to monitor as the game goes on with the Spurs playing Friday and Saturday night and the ice not being revealed until sometime around 4:00 PM this afternoon. The final piece of the Calder Cup championship puzzle has come into place with the arrival and distribution of the Calder Cup championship rings to players, coaches, hockey ops and staff members who were part of last year's historic achievement. "Ever since we won, I feel like that's all we've been talking about, "when are we going to get our rings? '," said Maxime Fortunus, captain of the squad. The six month process of designing the rings was an important one for the Stars organization because of what the ring represented to each individual and the group as a whole. "It's a symbol, a small thing, but it represents a lot. It puts everything in perspective, how hard it was to get that little thing and the feelings that it brought." 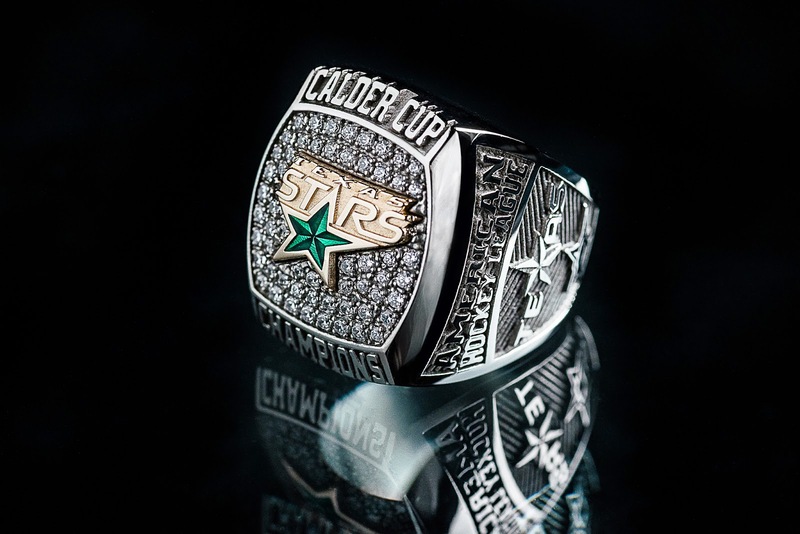 The design of the Stars' ring started almost immediately after the Calder Cup win, according to Michael Delay, VP of sales and marketing for Texas. Following league meetings in July, the Stars began the process of researching possible companies to create the lasting symbol of their championship run. "We looked at who had done rings for recent cup winners, some companies in town," said Delay. "Some companies reached out to us. We started there, picking our top few companies. We also reached out to folks from Grand Rapids and Norfolk. It was basic stuff: it needs to have the Calder Cup, the year, and names on some of them." Texas selected Baron Rings out of Canada to create the rings. They were last involved memorializing the AHL's top prize in 2011 when the Binghamton Senators defeated the Houston Aeros. Baron brought some design concepts to the initial meetings. Early proposals included the Calder Cup on one side of the ring and the other three trophies Texas won on the opposite side, an idea that Delay had seen on a Pittsburgh ring from one of their recent Stanley Cup seasons. Another early proposal used the Stars' secondary logo on the top of the ring. Over the next four weeks, Texas worked with Baron to design the rings, going through over 30 iterations before arriving at the final design. It was a collaboration between Delay, Rick McLaughlin, Scott White and then-owners Hicks Cedar Park. Throughout the process, Delay said the sides of the ring, called the shoulders, were the part of the ring that "had the most back and forth." Once the design was finalized, Baron kicked off the process of creating all the rings, which took approximately ten weeks. The Stars ring was unique in that it is the first championship ring created using 3D printing technology. "A Baron graphic designer sends the ring info to production, which will then get programmed into the 3D printer. The 3D printer prints out a wax of the ring, which is then casted in the chosen metal. In this case, the ring was two separate pieces. 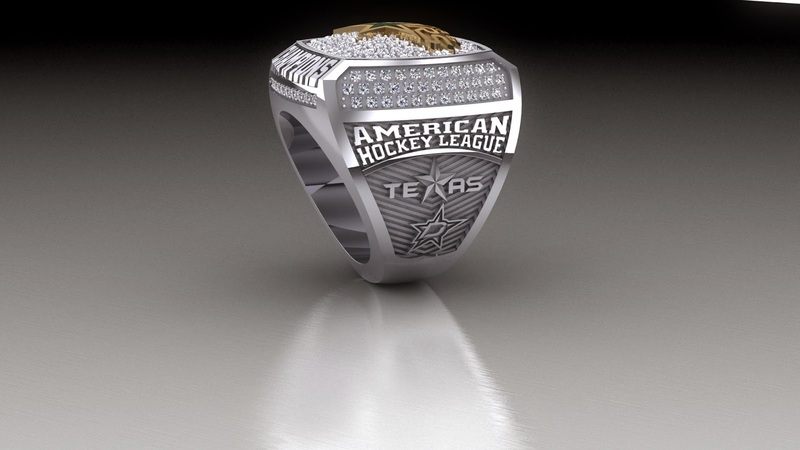 The base of the ring was create in white gold and the Texas Stars logo was in yellow gold. Both pieces are casted separately and soldered together. "From there it goes into the setting process. The ring had 143 stone set over the top and side of the ring. After setting is done, the ring goes into the final stages of adding the color green to the logo and polishing." The player and coaching staff rings are 6kt white gold with 6kt yellow gold for the logo. Each weighs approximately 50 grams (1.76 oz) and has 143 synthetic diamonds for a total carat weight of 1.75. 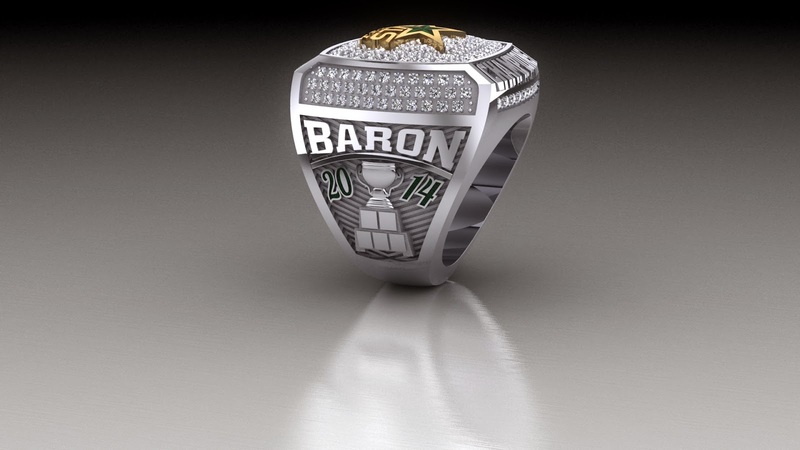 In addition, each player ring is personalized with their name across the top of one shoulder and their number across the base of the Calder Cup. Delay and his group were responsible for making sure all the names were correct not just for players but also for Dallas staff, hockey ops, Texas hockey staff and front office staff in Texas. Once the rings arrived, Tom Gaglardi, Jim Nill and Scott White were on hand in Texas to distribute them to players who are still in the organization. Others made the trip up I-35 to be handed out to players and staff who have moved on within the organization, such as Patrik Nemeth and Owen Newkirk. Dallas handled the logistics on sending rings to players and staff who have left the organization, such as Cristopher Nilstorp and Willie Desjardins. After spending six months working on the design, Delay also admits that no matter how the rings turned out it was about something bigger. "Of course, I care how it looks, but to a certain extent, I'm just happy to be getting one," he said with a smile, eyeing the ring on his finger as he sat at his desk. "As long as people know what it is, I almost don't care what it looks like. I'm just happy to have been a part of the entire thing." 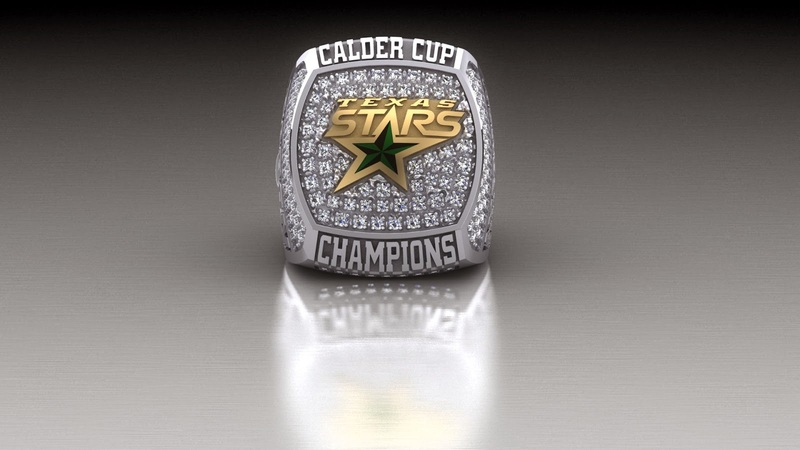 Saturday night's promotional giveaway will be a statue replica of the Texas Stars' Calder Cup championship rings. 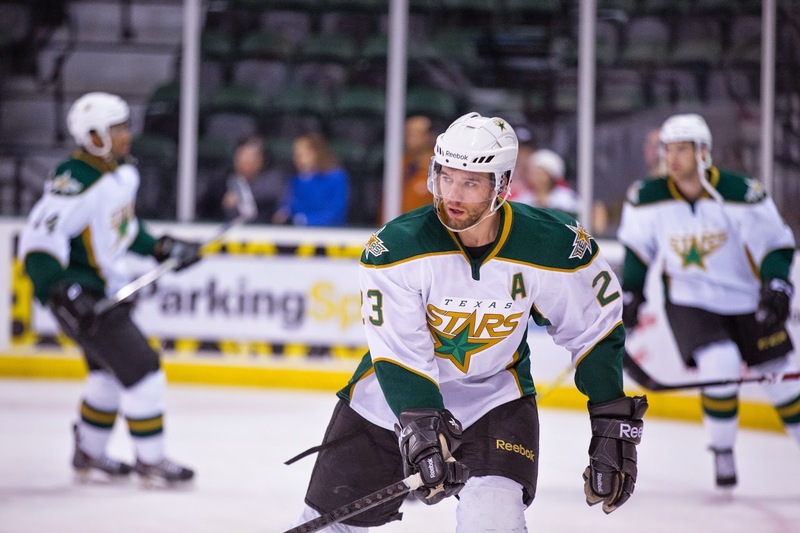 Thanks to Baron Rings and the Texas Stars for the images included in this article. Looking for two points to stay afloat in the playoff race, Texas squandered a two goal lead against their closest geographic rival to fall in overtime. It was their AHL-worst tenth overtime loss of the season. "We came out flat plain and simple," Fortunus said of the third period effort. "We have to find a way to come out with the lead and stick to our game. It's an issue we've been working on this year." After going up 2-1 after forty, Texas allowed an AHL season record 25 shots in the third period and a San Antonio goal to even it. The Rampage's first shot of overtime beat Jussi Rynnas, his 45th shot faced on the night. "Jussi was outstanding," said Coach Derek Laxdal. "He gave us a chance to win the game." "At 2-0, we had good control of the game. A bad call stung us on the penalty kill, an icing that should have been called. But that seems to be a common happening in the AHL right now with some of the local linesman, so that's something we may have to address with the AHL." Regardless of the officiating, Laxdal conceded, "We didn't show a lot of composure in the third period. We sat back a bit. San Antonio had their way with us." Texas' combo of Eric Faille, Branden Troock and Jesse Root again had a positive impact in the first two periods despite the loss. They generated the first goal and earned Texas a power play in the second. At the same time, they had a penalty that led to the Rampage's first goal of the night. The fourth line frustrated the Rampage in their defensive zone and drew the holding call that led to Morin's second period power play goal. Early on, it was Julius Honka breaking in alone thanks to the aforementioned nifty work in the neutral zone by the third line. Eric Faille took a hit at mid-ice and sent a pass to Jesse Root at the blue line. Faille took that hit from two players, giving Julius Honka a chance to walk in unaccosted and backhand the puck over Dan Ellis for the opening goal. The bottom six contributed further in the second period as William Wrenn drew a holding call on Vincent Trocheck and put his top six on the power play. Derek Meech swooped in low from the left point on the advantage. His initial bid bounced off Ellis and out to Derek Meech. The Rampage would get one back on the Stars late in the second period. With Branden Troock in the box on a 'closing hand on the puck' call, Jesse Blacker found twine from the left wing dot to set the score at 2-1 after forty. Troock had been attempting to setup a 2-on-1 but got caught being a little overzealous. The third period was a rough one for Texas. Jussi Rynnas faced 25 shots in the third period alone and stopped 24. The single Rampage goal that did pierce his armor came off a hard rebound from the shot of Steve Kampfer. Connor Brickley finished the play on the backdoor for a 2-2 tie. Texas managed its way through 4-on-4 overtime and dropped to 3-on-3 overtime with 2:25 left in the frame. Greg Rallo got the initial shot and Maxime Fortunus jumped up to attempt the rebound. Rocco Grimaldi beat him to the puck and counterpunched for the 3-2 game winner. "Inches make the game," said Fortunus. "If you don't put that puck in, they're coming back at you." Laxdal added, "It's one of those plays where you get stuck in between. When you go against a speedster like Grimaldi, good luck." Texas stays in town to play Charlotte on Saturday. As expected, the American Hockey League announced today the formation of the Pacific Division. The division will host five teams, which are all relocating from east coast cities, all in California. Adirondack Flames (Calgary) will move to Stockton, CA. Oklahoma City Barons (Edmonton) will move to Bakersfield, CA. Norfolk Admirals (Anaheim) will move to San Diego, CA. Worcester Sharks (San Jose) will move to San Jose, CA. Manchester Monarchs (Los Angeles) will move to Ontario, CA. The press conference was much as expected. GMs called out the big points: higher focus on player development, ability to monitor prospects, and ability to grow the brand of hockey in California. The Oilers' Kevin Lowe said that they expect to add 20-25 days of practice to the schedule thanks to the proximity of all the teams in the division. Brad Treliving alluded to schedule tweaks in favor of development that this California-based division will see. It is unclear what those will be right now. It is assumed fewer games for this division is on the table. It remains to be seen. No comments were made regarding schedule makeup. It is assumed these teams will play each other a lot, but how often will Texas play them? It also remains to be seen. No comments were explicitly made regarding backfilling those relocated teams with ECHL teams. Luc Robataiile said that Manchester would get another team. The ECHL expects to make its announcements regarding team movement on Friday. As announced yesterday, the American Hockey League will be making a major announcement about the 2015-16 season today at 2:30 PM Central from San Jose's SAP Center. It is expected to be the announcement of the AHL's Pacific Division, which will feature five California based teams that will relocate from the East Coast. It's a big deal, so the league will be streaming the press conference across multiple different places. A YouTube stream has also been added by the Oilers. UPDATE: Center Taylor Peters has been assigned to Idaho. Welcome to the other half of the season. We're post All-Star break in central Texas and the two teams based in the Lone Star State will face off four times in the coming six games. San Antonio has had a pretty good season up until now and is battling for home ice advantage. They currently sit in fifth place by standings and points percentage. The Stars are battling for a spot in the playoffs themselves. These games against their closest geographic rival are all four-points games, as they say. Is it too melodramatic to say this homestand is the key to the season? If not, certainly the month of February will decide the Stars playoff fate. If you peek ahead on the schedule, the Stars play five of the next six at home. Then they hit the road for a six game set that spans Iowa, the Northeast and OKC. They will play at home on February 10th and not again until the 27th. That game on the 27th will kickoff a season-long seven game homestand. If Texas can't keep up a better than .500 points percentage through February, that homestand might not matter. If they can though, the homestand in March will be the chance to 'snap it off' and finish the fight strong. Granted, there will be plenty of hockey to play after March 17th, but Texas has a chance to make their playoff fate a foregone conclusion (in either direction) between now and then. You have to win home games to have success in the league. The road is a toss-up and the Stars need to bank point here tonight and over the coming two weeks to save up for the harsh 'winter' that will be mid-February. One saving grace on the roadie is the opponent mix, which features four games against teams that should be at or below the Stars in the standings. So, long story short: win tonight and make February easier on yourself. Fortunus did not tally a point in the game. He had an amazing between-the-legs breakaway chance that was stopped though. Maybe he should be up for the shootout if Texas ever plays one of those games. Charles Hudon of the Hamilton Bulldogs, Brendan Leipsic of the Milwaukee Admirals and Mark McNeill of the Rockford IceHogs all recorded hat tricks to pace the Western Conference to a 14-12 victory over the Eastern Conference in the 2015 AHL All-Star Game at the Utica Memorial Auditorium on Monday evening. The Western Conference earned a split of the 2015 AHL All-Star Classic presented by Turning Stone Resort Casino following the East’s 15-11 win in Sunday’s Skills Competition. Hudon, a 2012 draft pick by the Montreal Canadiens and the AHL’s leading rookie scorer so far this season, added an assist for a four-point night and was named the co-winner of the Turning Stone Resort Casino Most Valuable Player award, sharing the honor with Western Conference goaltender Jacob Markstrom of the hometown Utica Comets. Markstrom, currently second in the AHL in goals-against average (1.92) and save percentage (.934), had the top performance by a goaltender in the game, stopping 16 of 18 shots in the first period. The highest scoring game in All-Star history saw 26 goals scored by 17 different players. Rockford’s T.J. Brennan notched a goal and four assists, Chicago’s Ty Rattie picked up a goal and three assists, and Adirondack forwards Drew Shore and Emile Poirier added a goal and two assists apiece for the Western Conference. Binghamton’s Shane Prince led the Eastern Conference offense with three goals and an assist; Norfolk’s Chris Wagner tallied a penalty-shot goal and added three assists; and Portland’s Brendan Shinnimin scored twice, notched an assist and recorded 10 of the East’s 59 shots on goal in the contest. Goals were also scored by Grand Rapids’ Teemu Pulkkinen, Syracuse’s Jonathan Marchessault, Manchester’s Jordan Weal, Albany’s Joe Whitney, Springfield’s Austin Madaisky, Hartford’s Chris Bourque and Providence’s Alexander Khokhlachev. The road to the 2015 Calder Cup Playoffs continues when the American Hockey League’s 79th season resumes on Thursday. Texas' lone All-Star representative took home some hardware on Sunday night after tying wtih Chris Bourque in the Accuracy Competition. Maxime Fortunus, the captain of the West All-Stars, shot four targets in six shots to earn a point for the West in that competition. Overall, the West lost 15-11. Fortunus also had a nice swooping backhander in the breakaway relay, which is embedded above. Tomorrow's AHL All-Star Game is at 6 PM Central time and is on FOX Sports Southwest as well. According to Coach Derek Laxdal, Travis Morin will not participate in the AHL All-Star skills competition and game today and tomorrow, respectively. The Stars' leading scorer sustained a lower body injury on Friday night and managed through the injury Saturday. Maxime Fortunus will be the Stars' only representative at the All-Star game. It is unclear if any replacement would be named for Morin. Fortunus and his family had a long day of travel today. He will participate in the skills competition tonight, which will be on FOX Sports Southwest this evening. Texas got back-to-back wins in a two game set at home for the first time all season with a big win against the Chicago Wolves tonight. The high-scoring 5-4 victory was powered in large part by the all-rookie third line of Jesse Root, Branden Troock and Eric Faille. "Coach wanted our line to cause havoc on the ice, so we were high energy out there tonight," said Troock. "It's pretty easy to play with them, we roll really well. We've been drawing up some plays that have been working for us." The biggest play for the trio came eleven seconds after Brendan Ranford tied the game for Texas in the second period. Jesse Root got his fourth of the year to put the Stars ahead for good. "It was a big goal," said Root. "That's what you have to do in these games. Chicago is a great team, and they were making a push. That swung the momentum in our favor." Coach Laxdal had asked for more from his third line and he said they "did exactly what we asked of them" in both games this weekend. The Stars got on the board twice in the first, both thanks to their defensemen and traffic at the net. Cameron Gaunce struck first, an unlikely blast from the veteran blue liner. Justin Dowling set up the goal, which sailed in clear from the point. On the power play, Julius Honka scored from the blue line as well. A nice pass from the low right wing side by Morin changed the angle enough for Honka to slip the puck in five hole on Binnington. Honka gave it back later in the period of a giveaway that turned into a Chicago 2-on-1. Ty Rattie passed to Phil McRae, who beat Rynnas for the Wolves opening goal. Pat Cannone finished off a quick play with a one-timer shot on bent knee from the wing side. The Wolves quickly changed the angle of attack from right wing to left and Cannone had an empty net. Chicago went up 3-2 on a pinball play that saw Rynnas make the first and second saves but put the puck on the stick of McRae again. 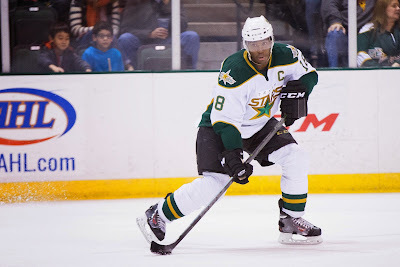 His unassisted tally came in the dying seconds of a penalty kill for the Stars. Julius Honka was in the box for a questionable boarding call. The Stars comeback came quickly thereafter. On a power play of their own, Brendan Ranford competed the pass from Justin Dowling to the things. Just 11 seconds later, Jesse Root and the third line got the 4-3 tally as Root rushed in and put a shot on Binnington despite being draped by a Wolves defender. The clubs traded goals in a high-flying third period. Curtis McKenzie opened the scoring with the net presence that the Stars had established all weekend. It was an easy tap-in for the forward after Jamie Oleksiak bombed a shot on net. Brendan Ranford passed the puck to the crease where McKenzie collected his fifth of the year. Petteri Lindbohm made it interesting with 9 minutes left, taking the lead down to one for Texas. The Stars would persevere. Texas now gets a required four days off. They will reconvene on Thursday for morning skate. Lather, rinse, repeat would be a nice formula for Texas against tonight. The Stars are looking to hit the All-Star break on a winning streak and can do that with a W against Chicago this evening. The Stars are in tenth place but are just four points behind the Wolves in seventh. Last night's victory put Texas in striking distance of the playoffs at the break. They could reach 8th with the win tonight. Last night was a physical game for Texas. There's no reason to expect anything different this evening. Chicago has a lot of size, and they use it. When you combine that with the let-them-play style of officiating, it can get pretty intense out there pretty quickly. The Texas Stars' two All-Star representatives had banner nights to help lead their team to a 3-2 victory over the Chicago Wolves tonight in Cedar Park. Captain Maxime Fortunus scored two, and Travis Morin had two assists. "We really needed to come out strong today," said Fortunus. "They're ahead of us in the standings and that's motivation enough to come out strong." The game had a physical edge to it as referee David Banfield let the teams play a little more than normal. The Stars matched up well against the physicality of a big Wolves roster. "Chicago has a couple lines with guys who play hard," said Coach Laxdal. "Our guys did a good job responding. It was a good game, a good game to watch." Fortunus expanded, "They're a team that comes strong. They've got a coaching staff that likes to put the pressure on other teams. That shows through their play. That's one aspect of the game we want to get on to." The game had an inauspicious start as Derek Hulak was dinged for four minutes on a high stick. The early power play is often more a negative than a positive for a club, and Texas took advantage of that. Morin, a huge part of the Stars power play, hinted at the Wolves' mindset in the situation, "I personally don't like it when I get a power play before I've really touched the puck or taken a stride. When you come off the anthem and immediately go to the power play, it can be a little difficult, I think." Texas held Chicago to a single shot in four minutes, an effort that Fortunus called "a big momentum builder." The Stars cashed in first in the second period. Brendan Ranford had an electrifying finish to a pass from Morin right on the doorstep. He deked Binnington to tap it in backhand for the 1-0 lead. Curtis McKenzie got the second assist as Laxdal reunited the Stars top line from the Calder Cup playoffs last year. Fortunus got his first of the night at even strength late in the second. With no one in the vicinity, he had plenty of time to wind up for a blistering slapshot from the right point. The net-front presence helped Texas get the goal. "Net front presence was better," said Laxdal. "It wasn't great but better. It was something we talked about after the San Antonio game. You've got to go to the front of the net." Chicago pulled to within one with a goal late in the second on the power play, a point shot of their own. Texas regained their two-goal lead in the third period with the seventh goal of the year and second of the night for Fortunus. This time it was Curtis McKenzie on the net front presence, tying up two Wolves to screen out Jordan Binnington. The best 'almost' chance of the period came as Binnington robbed Branden Troock on a two-on-one. The rookie forward got the shot off but found the glove of Binnington off the pass from Eric Faille. It was a well-executed play by Troock, Faille and Jesse Root, and Coach Laxdal praised the group for the effort. The Stars had a chance at the empty net late but couldn't convert thanks to a strong Wolves backcheck. Shane Harper got a late goal to make the final 17 seconds interesting, but Texas held on for the win. The same Wolves stay in town to play Texas again tomorrow night. Travis Morin, the reigning AHL regular season MVP, Calder Cup MVP and statistical leader in almost every meaningful offensive category for the Texas Stars, has signed a two-year extension to his contract with the Dallas Stars. Both years of the contract are two-way, meaning Morin has one salary in the NHL and another in the AHL. Morin was slated to become an unrestricted free agent at the end of the season. His new deal will keep him with the organization until 2017. Morin began his AHL career in Hershey after being drafted by the Washington Capitals in the ninth round. He only played a few games for the Bears from 2007-2009. 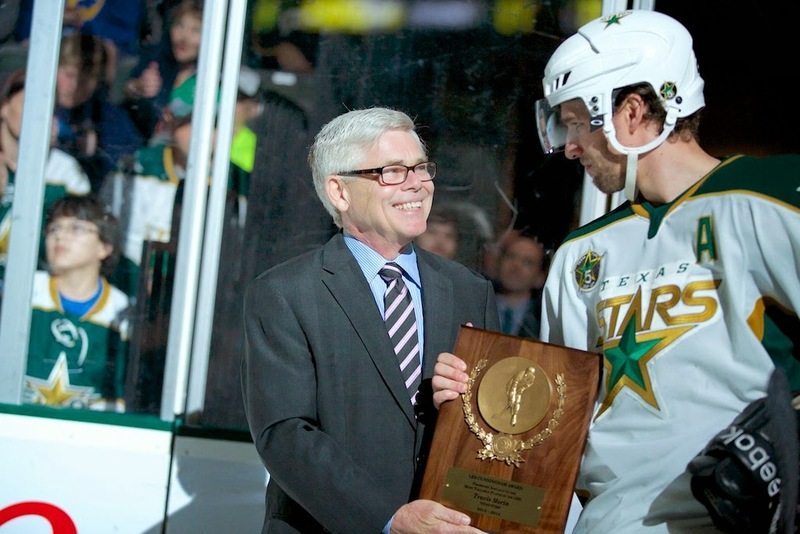 In 2009-10, he came to Texas on a PTO and eventually earned a standard player contract. He became a Dallas Stars contracted player the next year and played in his first NHL game. He has twelve games in the NHL in his career with a single assist. Of course, in Texas, Morin is arguably the best and most consistent player the team has had in its history. A massive difference maker at the AHL level and duly recognized for that by the league, having won MVP honors last season in the regular season and playoffs. Morin is currently sitting in a state of limbo with the organization. If he is recalled again and plays in a game, he will lose his waiver-exemption and could be claimed by any team in the league if he is placed on waivers with the intention of sending him back down to Texas. It is a positive sign for the organization to retain Morin on this contract. There is no doubt he would have had some lucrative deals on the table this summer in terms of AHL money. Sadly, with the loss of CapGeek.com, we will be unable to determine his new AHL salary, but this deal could easily see him in Chris Mueller territory ($300,000 in the minors). There is no doubt that his familiarity with the team and the area played a part in the signing. Morin and his wife have two young children who have both grown up in Cedar Park. 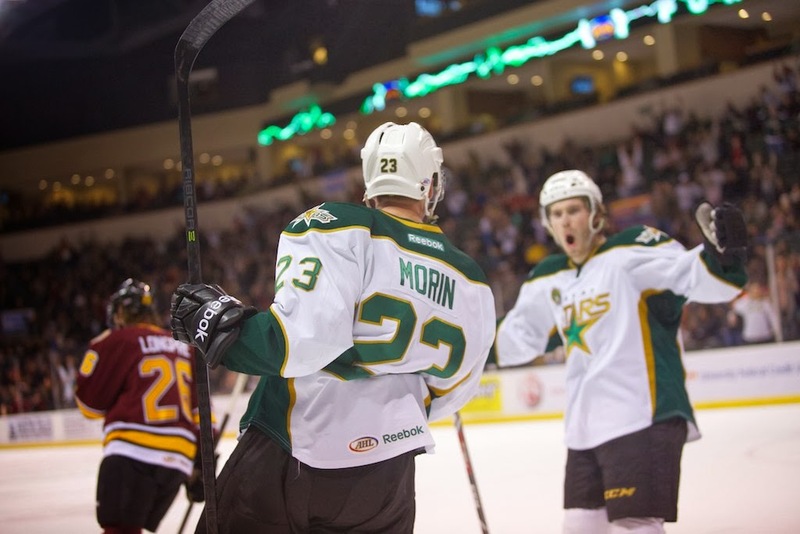 Morin will represent the Texas Stars and the Western Conference at the AHL All-Star Game next week in Utica. It is his third time being named and second time participating in the mid-season event. Texas has blown past the halfway point of the season and somehow has yet to play two of the teams in the Western Conference. One of those two, Chicago, comes to town tonight for their only visit to the Cedar Park Center this season. The Milwaukee Admirals are the other team and the Stars won't play them for the first time until March 14th and 15th. The return games for both teams in the Midwest will come in pairs, one in mid-March and the other in early April. Chicago is always a team that fields a competitive roster. Part of that comes from their independent ownership with some deep pockets. Whenever the team comes up for a new affiliate, it is the belle of the ball in that summer's affiliation race. St. Louis is the current affiliate and they have stocked the team with some pretty prize prospects in the past. Jake Allen, now splitting time in net in St. Louis, manned the net in Chi-town last season. This year, Matt Climie (on an AHL deal) splits time with rookie Jordan Binnington. Binnington is 12-6-2 with 2.31 GAA and .913 SV%. Climie has been a bit unluckier at 9-9-3 despite a near identical 2.37 GAA and .911 SV%. St. Louis property Ty Rattie is near the top of the list. The second-year forward got a few games in St. Louis last year but has played all 41 this season with the Wolves, earning 27 points. If Texas wants to make the playoffs, they will need to pick up the pace. At the current run-rate, the Stars need 41 points in their remaining 36 games just to tie up eighth place. That's approximately a 20-15-1 record with minimal OTLs. If the Stars' current OTL record holds, that would look more like 16-11-9 for a total of 32-26-18. Chicago is a team that is also looking for one of those last few spots. Tonight and tomorrow's games are what you call 'four point games', where the Stars can inflict maximum damage by winning outright in regulation to not only add to their total but steal potential points from Chicago. If they can win both outright, Texas will head to the break with 45 points, just two behind Chicago and with a better points percentage to boot. Time to make that push. As the Idaho Steelheads hit the ECHL All-Star break, they currently sit in a tie for first place in the Pacific Division of the Western Conference with the Ontario Reign. Both teams have 52 points, but the Steelheads have a better winning percentage at the moment so they take the top spot. There have been 16 games since the last Steelheads update was posted and in those 16 games, Idaho has managed to get points in 13 of those games, including 11 wins and an 8 game point streak, for an impressive 11-3-2 record over that span of time. If you remember that last Steelheads update where I talked about the depth on this team, you’ll know where most of the scoring is coming from. You’ve got your usual cast of characters putting pucks in the net (Jason Bast, Alex Belzile, and Brett Robinson) but you’ve also gotten contributions from the likes of Ludwig Karlsson, Patrick Cullity, Troy Vance, Matt Case and even new addition Jefferson Dahl. First of all, think of these as representatives of the team. There have been contributions up and down the lineup over these 16 games, so don’t forget about the likes of David deKastrozza, Gaelan Patterson, Steve Qualier and Wade MacLeod. The biggest thing to notice about the listed contributors, are that three of them are defensemen. Coming into this stretch of games the Idaho defense was most notable for their ability to set-up goals vs scoring them. The defensive corps heading into the All-Star break will have cumulative totals after this run of games that read 11 goals and 64 assists. That is an astonishing 75 total points from defensemen in only 39 games played, that’s almost 2 points per game! Just for the heck of it, throw Olivier Roy’s lone assist of the year into that total and you’ve got 76 points. The scoring from the forwards have been outstanding all year long, but the fact that the defensemen are starting to take an active role in putting the puck into the net, re-establishes the idea of defensemen being able to take on some of the scoring load in Brad Ralph’s offensive system. One last note on overall scoring for Idaho; they have seven players that have 20 or more points and then another eight that have 10 or more points, balanced scoring does not appear to be a problem at the moment for the Steelheads. The next item to take note of, is that the defense is continuing and improving its strong play over the past month as well. Over the same 16 games the Steelhead have only allowed 38 goals against with 2 of those being the “team goal” for a shootout loss. Even including those goals, puts them at 2.375 goals allowed per game. Their season average for goals against sits at 2.65 so it’s nice to see the team trending in the positive direction with regards to letting the other team score. For the record the Steelheads have scored 126 goals on the season, which is good for 3.23 goals per game. The other distinction the Steelheads have is that they are currently tied atop the ECHL for most one goal victories as that total stands at 14. This is clearly a team that will be comfortable in tight games come playoff time. The goaltending tandem of Olivier Roy and Henri Kiviaho have also helped contribute to the team’s success as of late. Roy has been steady and what you would expect out of a top flight goaltender at this level. He has given Idaho a chance to win just about every game he has been in and will in fact be the All-Star representative for the Steelheads this week. Kiviaho has turned into a nice surprise. After starting off the season as a relatively unknown assets, Kiviaho took some time with Dallas Stars goaltending coach Andy Moog back in November and since that meeting, things have taken a positive step forward for him and the team. His goal against has continued to go down, and his save percentage has continued to tick up. In his last three appearances he has only allowed a total of four goals while facing 73 shots. From watching him on the ice, you get the sense he is getting more comfortable with the North American game and because of that is gaining in his confidence as well. The Steelheads just finished a six game in nine night home-stand which led them to a 4-1-1- record over that stretch, but they still end up tied with the Ontario Reign (Manchester Monarchs/St John’s Ice Caps) for 1st place in the Pacific Division lead at the All-Star break. Idaho comes right out of the All-Star break by having to head up to Alaska to take on the Aces (Iowa Wild) for three games in three nights before heading back south for three more games against the Ontario Reign in Ontario. So another six game in nine night stretch but this time on the road with a tough travel schedule included. Look for Kiviaho to get at least the first start on Friday since Olivier Roy will be meeting the team in Alaska after the All-Star game on Wednesday. After the three against Ontario, the Steelheads will play three home games against the Utah Grizzlies over the next 11 days. The defense will continue to be tested over the next bit of the schedule as Patrick Cullity (Springfield Falcons) and Charlie Dodero (Syracuse Crunch) have been loaned out to the AHL for the foreseeable future. Good Luck to them. Also Mike Dalhuisen returned to Idaho last week and got four games under his belt and was able to notch his first point of the season with an assist in Saturday night’s win against the Ontario Reign. If there is anything or anyone you want to know about in the next Idaho Steelheads update, leave it in the comments or send me a message on twitter @mulhern4. 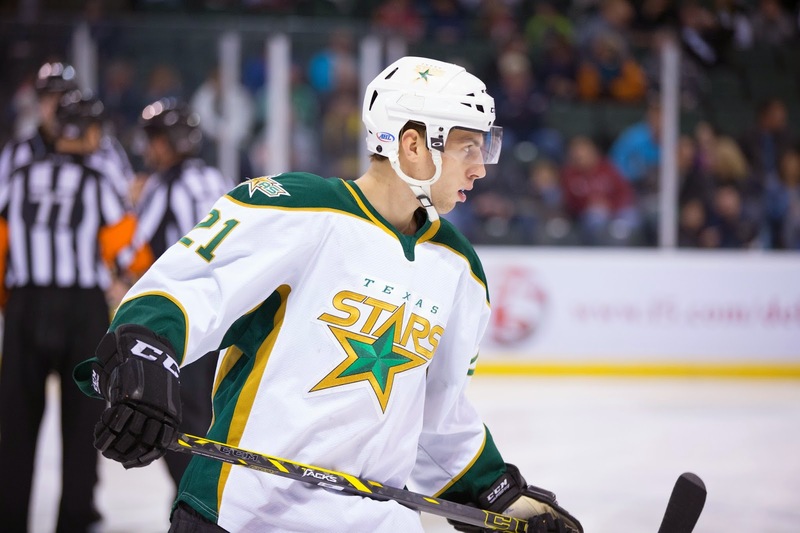 Jyrki Jokipakka and Jamie Oleksiak have both been assigned to the Texas Stars for the weekend. The two defenseman are both waiver-exempt, allowing them to be easily sent down to Texas. The NHL All-Star Break means they'll be available to get some high quality ice time in Texas this weekend. The Stars play Chicago Friday and Saturday. Expect both to be recalled after the break. The Stars opened the scoring but couldn't make it stick as they allowed the next five goals for San Antonio. Texas fell by a final score of 5-2 on Scott Glennie's late power play goal. In positive news, Texas was perfect on the penalty kill to extend their lead as the best in the league. Goaltending continued to be an open issue with Jack Campbell stopping just 21 of 26 shots against him (.808 SV%). A pair of goals in the opening minutes of period three allowed the San Antonio Rampage to pull away for a 5-2 win over the Texas Stars on Tuesday night at AT&T Center. Despite the loss for Texas, Scott Glennie tallied a two-point night for his 100th career point with a goal and an assist. Dan Ellis took the win for the Rampage (23-13-3-0) stopping 22-of-24 shots. 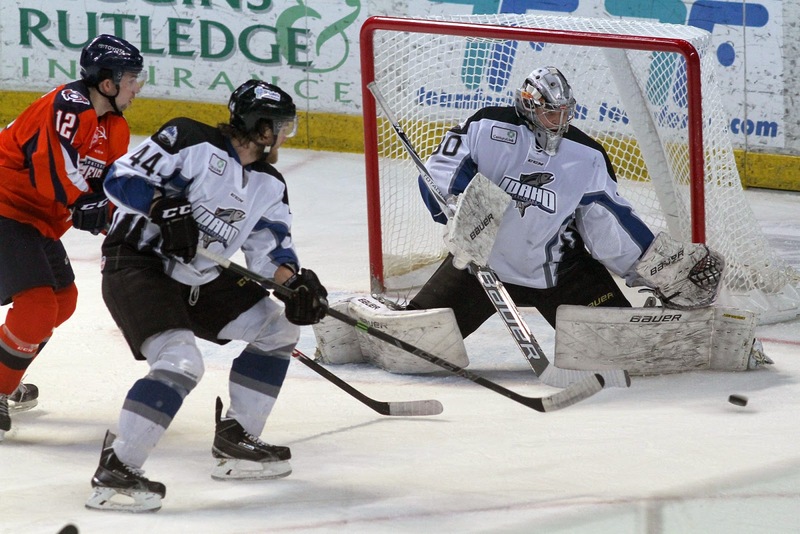 Jack Campbell suffered the loss stopping 21-of-26, and five different players scored for the Rampage. The Stars (16-15-9-0) begin a five-game homestand on Friday when they host the Chicago Wolves at 7:30 p.m. in the first of a weekend pair between the two clubs. Texas opened up the game's scoring at 4:40 of the first when rookie Jesse Root deflected Cameron Gaunce's shot for his third goal of the season. Glennie also tallied an assist after touching the puck back to Gaunce from the left faceoff circle. The Rampage quickly responded less than two minutes later as Ryan Martindale buried a breakaway chance to knot the game and cap off the first period scoring. In the second, San Antonio struck for two more quick goals just over a minute apart with Connor Brickley at 8:18 and Logan Shaw at 9:21 each finding the scoresheet for the Rampage. After killing off a Texas power play that carried over to the start of the third, Corban Knight and Bobby Butler each added two more quick goals for the Rampage to extend their lead to 5-1 less than three minutes into the frame. Glennie added a power play goal for the Stars at 8:11 from Julius Honka and Curtis McKenzie for his milestone point, but that's where the offense would end in the game. The Stars finished 1-for-7 on the power play and tallied a power play for the third straight game. The Texas penalty kill also held serve as San Antonio finished 0-for-2. Don't take tonight's lines as gospel. Lots of shuffling. 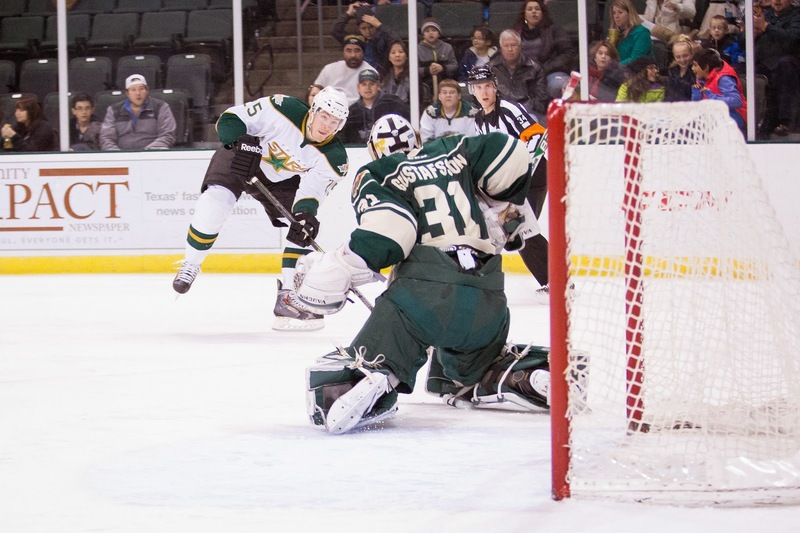 The only game on the AHL schedule today pits your Texas Stars against their I-35 rival, the San Antonio Rampage. Since last playing, the Rampage are 5-3 and have held on to a playoff position but slipped a bit in the rankings to six. Texas is 3-4-1 in the same time scale and has dropped to 10th in the standings. This year overall, San Antonio is 3-1 against Texas through half of the season. That means the Stars will be getting a steady diet of the Rampage over the final 38 games, needing eight games more to reach their 12 game total against SA. The Rampage are a good team this season and depending on how the Panthers do the rest of the way and in the playoffs, they could get better with reinforcements from Florida. If they end up in the bottom half of the bracket, they could be a trendy upset pick based on who they get back from the NHL. One thing that is surprising going into this game is the Texas Stars' special teams. Texas is the #1 ranked PK in the league right now by a thin margin at 87.6%. Hershey is just behind at 87.5%. After 16 games in the season, the Stars were at 80.8%. Since that point, the Stars are an eye-popping 93.8% on the PK since Thanksgiving. In assignment news, Curtis McKenzie will be available for tonight's game after being assigned to Texas. He did not play for Dallas during his callup. Looking to replicate last night's magic, the Texas Stars fell short in Oklahoma City this evening by a 5-2 final. Jussi Rynnas got the call again but could not pull off the stellar performance he had last night while Texas' offense was unable to give him much run support in the effort. Texas scored the first goal in the contest, but they would allow the next three, which would be enough to put the game out of reach for the visitors. Jussi Rynnas stopped 28 of 32 in the game. Richard Bachman halted 30 of 32. Derek Meech opened the scoring for Texas on the power play halfway through the first. Former Star Richard Bachman couldn't collect the initial shot from former teammate Greg Rallo, and Meech found the net. The goal halted a streak of 36 killed penalties for the Barons. Andrew Miller got a rebound goal of his own behind Rynnas just 88 seconds later. Iiro Pakarinen had the initial shot on that even-strength marker. That would put the score at one all after forty with the Stars leading shots at 13-10. Early in the second period, OKC jumped ahead off the fourth goal of the year for Bogdan Yakimov. It was a skill move for the rookie, who picked a corner on Rynnas from the dot for the 2-1 lead. A few minutes later, vet Jason Williams got a close-in goal off the scramble at the net to make it 3-1. Late in the second, it appeared Texas had cut the lead to 3-2 on a shot by Justin Dowling. Texas alternate captain Cameron Gaunce begged for a review of the play at the next stoppage to no avail. The period would end at 3-1 as a result. Dowling made sure he got on the scoresheet in the third period though. The 3rd year Star lofted a pass up to Derek Hulak on a Texas penalty kill. Hulak beat Bachman, scoring the first shorthanded goal against the Barons in the 2014-15 season. Yakimov scored his second of the night with just under seven minutes left in third period to salt things away for OKC. Pakarinen potted an empty netter in the game's final minute to end all doubt. Texas heads home for now before making the day trip to San Antonio on Tuesday. The expectations are always sky high on a first-round draft pick. Only the best of the best make it to the National Hockey League as 18-year-olds. For the rest, it takes a few more years in juniors, college or Europe to put the finishing touches on their game before transitioning to the American Hockey League. Most rookies in the AHL coming out of juniors have already turned 20 years old. 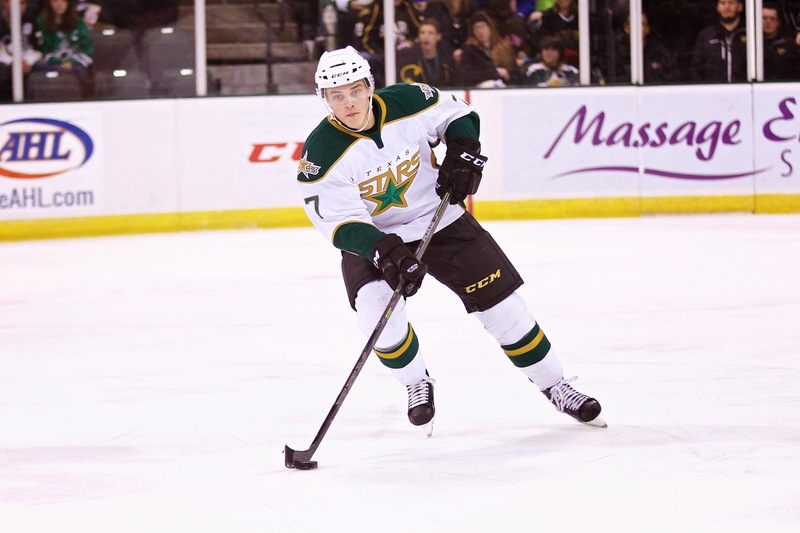 But not Texas Stars defenseman Julius Honka. A unique set of circumstances placed the Dallas Stars’ 2014 first-round pick with the AHL’s Texas Stars at the tender age of 18. After drafting Honka and deciding not to place him on the NHL roster, Dallas Stars GM Jim Nill had a choice to make: AHL or Europe. “He said right from day one, ‘I want to go play in the American League. I want to be a pro hockey player and learn what it takes,’” said Nill. And so at 18 years, 10 months, and 8 days, Honka became the youngest player ever to play for Texas and the second youngest on an AHL opening night roster this season. Read the rest at TheAHL.com. UPDATE: Dallas has recalled Curtis McKenzie and Jyrki Jokipakka from the Texas Stars this morning. Dallas plays at home against Washington tonight. That thing Texas did last night was beautiful. Shutting out the Barons, who have not been shut out all year, on their home ice was a masterful performance from the whole team. Jussi Rynnas took the cake, but Texas helped him hold it up by scoring a few as well. If the Stars could copy-paste last night to tonight, they'd do it in an instant. The biggest thing Texas will probably want to tighten up is the shot total against. Allowing 39 on net is not a good number for the Stars. Coach Laxdal has a magic number of 25; he likes to keep the opposition under it and his club over it. Look to see if they can do that tonight. Open question of what happens in goal. OKC is starting a 3-in-3 so they probably go with Bachman to get Brossoit rest for Sunday. The Stars have an opportunity to ride the hot hand and go to Rynnas again. We'll know more after morning skate. 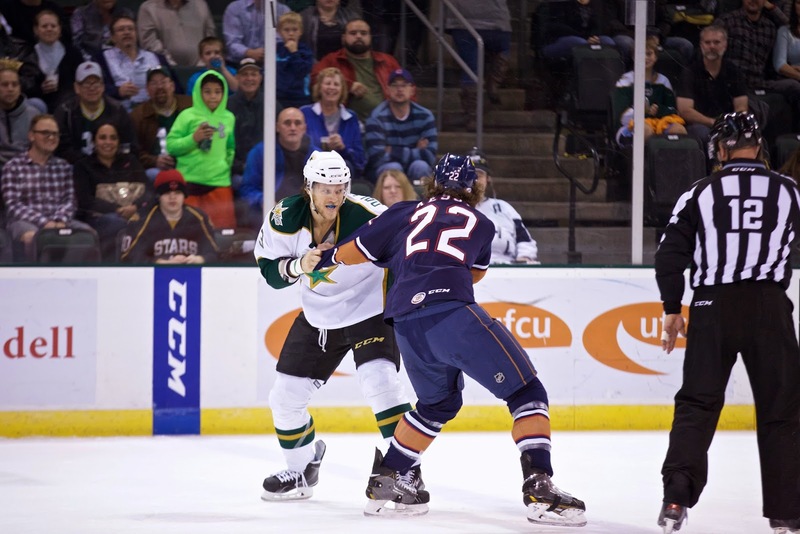 No matter what the circumstances, the Stars seem to bring their best game against the OKC Barons. After earning just one of six points at home this past week, the Stars handed OKC their first shutout of the year with a 2-0 victory. Vets Travis Morin and Maxime Fortunus, also the team's two AHL All-Star representatives, were the two goal scorers. Jussi Rynnas earned first-star honors with a 39-save shutout, his second shutout of the year, after being pulled on Wednesday at home. It was the first time all year that the Barons have been held without a goal. Texas got a little help from Charlotte in the standings as they beat Toronto to keep the Marlies at 40 points. The Stars move to 41 points and 9th place in the West. 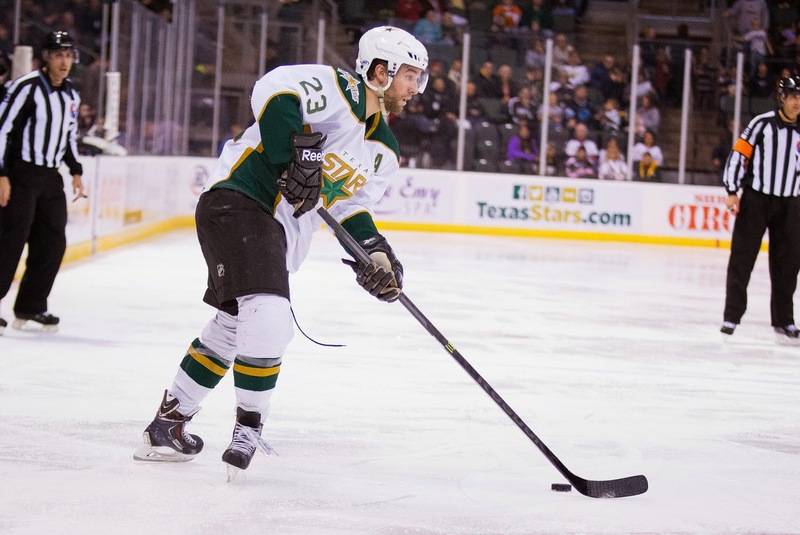 A strong second period for the Texas Stars the difference on Friday night in a 2-0 shutout win over the Oklahoma City Barons at Cox Convention Center. Travis Morin tallied the game-winner, and Maxime Fortunus also scored for Texas. Jussi Rynnas turned aside 39 shots in net for his 10th win of the season, while the Stars' special teams unit killed off three seperate penalties in the middle frame to set the tone for the road win. Scott Glennie appeared in his 200th career game as a pro and tallied an assist. It was the second shutout of the season for the Stars and Rynnas, who blanked the Utica Comets, 1-0, back on Oct. 18. The Stars (16-13-9-0) and Barons (26-9-2-2) close out their two-game set Saturday at 7 p.m.
Afer a scoreless first period, the Stars took control on both sides of the puck in period two. Through the first 10 minutes of the frame, Texas killed off three power play opportunities for the Barons' third-ranked unit in the league. The Stars then went to work offensively as Morin opened up the game's scoring with a wrist shot from the left circle at 10:27 for his team-leading 14th of the season. Glennie tallied the assist on the goal from blocking a shot in the Stars zone and feeding Moring through neutral ice to set up the rush. Maxime Fortunus extended the lead just over six minutes later with a wrist shot from the point to make the score 2-0, Texas. The Barons ratcheted up the effort in the third, outshooting Texas 14-10, and pulled goaltender Laurent Brossoit for the extra attacker in the game's final minute. Rynnas and the Stars weathered the storm to second the shutout win. Brossoit finished 25-of-27 in the loss. Overall, the Stars held the Barons scoreless on five power play chances, and finished 0-for-2 after scoring four power play goals over the past two games. Texas has now given up just five power play goals over their past 21 games, and have handed Oklahoma City three of their five regulation home losses this season. William Wrenn and Taylor Peters had the assists on the Fortunus goal for the Stars. Despite what the standings might say about these two teams, this is a competitive matchup. In the eight games up to this point, each has won four games. The Stars actually have more points in the season series, thanks to three of their four losses coming in overtime. OKC has 9 points to Texas' 11. After a homestand that was disappointing to say the least, Texas needs these two points to get their standings game back. Three games against teams all below Texas in the standings yielded just a single point thanks to the overtime loss to the Marlies. Toronto, once left for dead, jumped ahead of Texas in the standings last night with a win over Charlotte. They're on a 7-0-3-0 run in their last ten games, and they'll play again tonight, giving them a chance to put a three point cushion between themselves and the Stars. Just below Texas, Hamilton is also in action tonight. If Hamilton can beat Grand Rapids and the Stars fall to the Barons, tomorrow's game will feature the #1 Barons against the #11 Stars. For the Barons, it is expected Richard Bachman will go tonight and Brossoit tomorrow night. OKC is coming in on a three game win streak after sweeping their weekend 3-in-3 on the road last week. That would have completed an eleven game win streak for them if the Stars hadn't put up five goals on the Barons last time the two met on January 6th. Texas broke up a seven game winning streak that night and looks to do the same tonight. After leading 4-1 early in the second period, Texas gave up the next four goals and finished the game with a 6-5 loss to the visiting Rochester Americans. Coach Laxdal had a blunt assessment of the contest for Texas. "We didn't play with enough urgency and attention to detail. We laid an egg halfway through the game tonight, a big ostrich egg." The Stars had a sellout crowd, and new owner Tom Gaglardi was in the building so it was a bad night to lay an egg. Laxdal continued, "I thought we sat back a bit when we got up 4-1. Sometimes your mindset tends to think it's going to be an easy game. Even though we were up 4-1, we weren't playing great hockey. We got some breaks. We talked the last couple days on details of our game. If anything, we went away from it and it got worse. We touched base on that after the game." Jussi Rynnas got the start but only stopped 18 of 22 shots against, getting the pull after two periods. Andrey Makarov didn't have a very auspicious start himself, allowing four Texas goals on the first 13 shots of the game. Travis Morin and Justin Dowling each had two goals in the loss. Justin Dowling opened the night's scoring with his ninth of the year. The goal was originally credited to Derek Meech, who appeared to have tipped in Dowling's cross-crease pass from the left wing side. The puck went off a Rochester defender for the opening goal. Rochester came back on a 2-on-1 and tied it with a nice quick release from Tim Schaller. After Texas killed a penalty, Travis Morin charged up the ice and got his 12th of the year off a similarly quick release to regain the lead. Texas scored on the opening shift of the second period as Greg Rallo one-timed a Curtis McKenzie pass from behind the net. Two minutes later, Justin Dowling finished off a silky-smooth backhand pass from Brendan Ranford for the 4-1 lead on the power play. Things began unraveling for Texas thereafter. "It's always nice to get a couple quick goals," said Dowling. "But I don't think we fed off it." The Amerks' Brayden Irwin found himself uncovered in the slot and finished off a pass, similar to the Rallo goal, from behind the net for the 4-2 score. "We ended up having three forwards on one side of the ice," said Dowling of the goal. "If you want to win hockey games, that's never going to be a good thing in our D zone." Mikhail Grigorenko went bar down off the rush on Rynnas for the 4-3 margin and then Jerome Leduc polished off the comeback with a goal from the top of the left wing circle on Rynnas. It was tied after forty. Coach Laxdal explained, "Once we got up 4-1, we quit forechecking, and we quit working. We went right away from our break out on the power play and we couldn't get into the zone." Jack Campbell would start the third period after Rynnas allowed four goals on 22 shots (.818 SV%). Campbell would finish the game with the same save percentage. Tim Schaller would get his second of the night to start the third period. The forward tipped a point shot by McCabe off a faceoff in the Stars' zone. Travis Morin pushed the Stars back into it with a power play goal from the right wing circle, beating Makarov up high for his second of the night. On the next shift, it appeared Gemel Smith and Matej Stransky had combined for the go-ahead goal, but the referee had blown the play dead when the puck was under Makarov. Stransky knocked the puck in just after. No goal. With four minutes left, Texas had another power play opportunity and another chance to put themselves ahead for good. They failed to score, and it looked like overtime was imminent. With under two minutes left in the third, Johan Larsson collected the puck in the slot and buried it behind Jack Campbell low on the glove side. While the Stars pulled Campbell for the extra attacker, they would not have another goal in the offensively charged game. As an example of the missing details, Coach Laxdal broke down the last goal. "The exact video I showed the other day of a mistake we made on a goal against Toronto, we did it on the 6th goal tonight, exact. I'm not going to name the player but it's details that cost you the game. Those are big points we gave up to not just Toronto and Iowa, but also Rochester." Texas will play OKC for a two game set in Oklahoma starting Friday. Tonight's attendance was 6,863, a sellout. 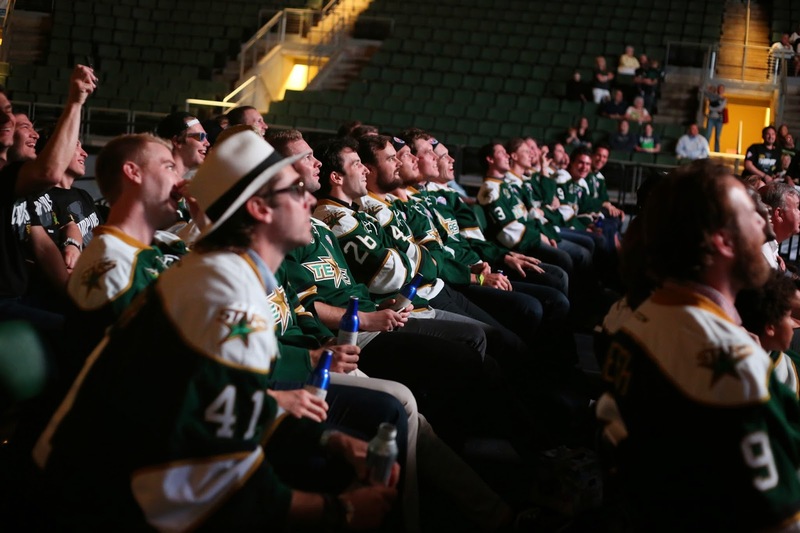 It was the Stars' third sellout of the season and second on a Wednesday. Looking back at last year's contests against the Americans, there is something to be said for the scheduling consistency. Last year, the two battled at the Cedar Park Center on January 15th. This year they will duel on the 14th. In last year's battle, the Stars beat the Amerks 4-1 and extended their franchise-record winning streak to ten games. This year, both teams come in with 15 wins. Texas has had more luck making it to overtime to pick up those 'loser' points, as they say. The Amerks have been much the same as the Stars. They put together one three-game win streak but have had a six game losing streak as well. Similar to the Stars again, injuries and callups have hurt the team. Leading scorer Phil Varone is in Buffalo along with Luke Adam, Zac Dalpe and Matt Ellis. Joel Armia has been skating in practice, according to Kevin Oklobzija, but he probably won't be playing as he's been off skates for two weeks and is a step behind the play. Further, Drew Bagnall, the captain, hasn't played in ten days because of a chronic shoulder issue. 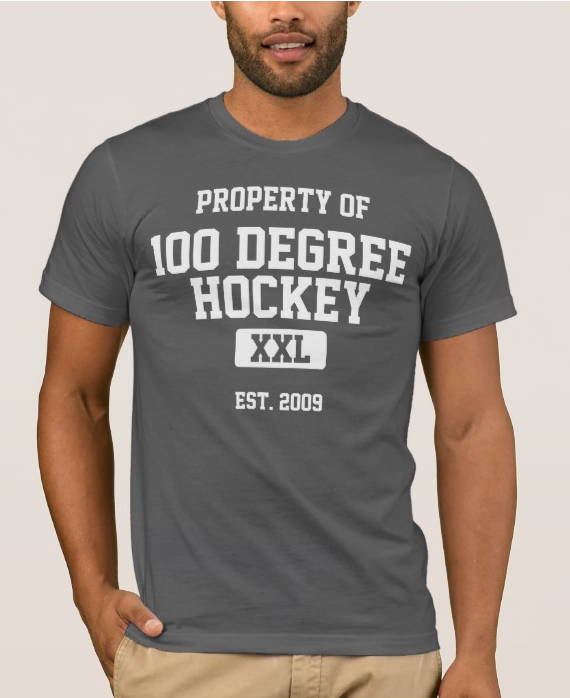 @100degreehockey Top guns are with Sabres, Joel Armia still hurt, PP in an 0-for-33 drought, AHL's worst road record, in 0-9-1 road streak. @100degreehockey On positive side, Andrey Makarov has been good and Matt Hackett was pretty much his old self in season debut Saturday. On the Texas side of things, Justin Dowling appears to be back in the lineup, which is good news for the Texas offense. It helps to buffet the blow from learning that Radek Faksa underwent surgery last week on his shoulder and will be out for a while. These are two points that Texas should be able to get, but that's what we thought about Toronto and Iowa as well. It figures to be a battle. 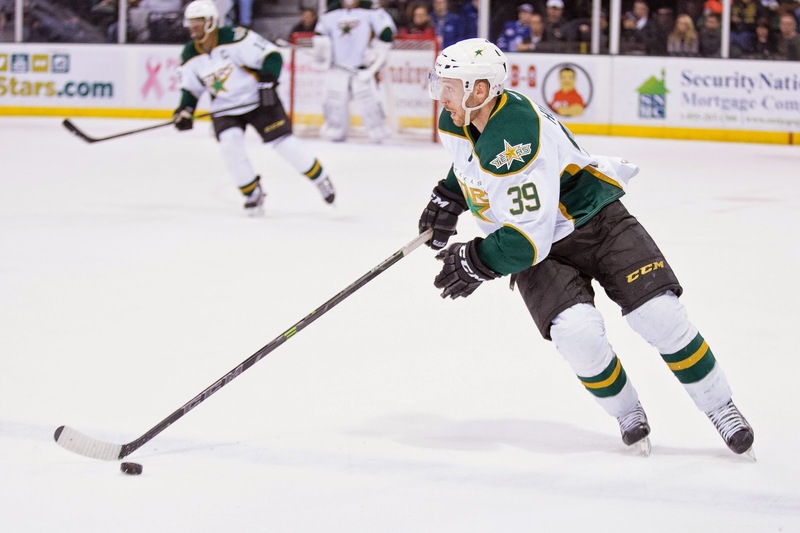 Mike Dalhuisen was reassigned to the Idaho Steelheads today by the Texas Stars. Dalhuisen spent much of his recent stay with the Stars in a 12th forward role on the fourth line. He was in and out of the lineup, often brought in against teams like OKC to battle Travis Ewanyk when things got rough. The move is a good hint that Texas is getting healthier. The Stars got Curtis McKenzie back in good health this weekend and look like they will regain Justin Dowling tomorrow. Branden Troock did not practice Monday but was in Cedar Park and not in any sort of cast or walking boot. 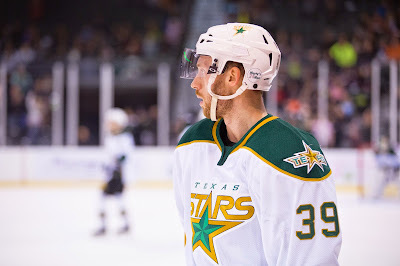 Radek Faksa will be out for a while after undergoing shoulder surgery late last week though. Yesterday, it was unclear if Texas might lose a forward or two to Dallas. Jamie Benn, Vernon Fiddler and Tyler Seguin all missed practice with various maladies. All three returned to morning skate today, so it looks like Texas will keep their current set of forwards for today. After overcoming two one-goal deficits and charging ahead in the third, Texas fell to Toronto in overtime on Saturday night by a 4-3 final. "It's a big point when it looked like we weren't going to get anything early," said Coach Laxdal. The Stars had quite a few positive signs in the game: they scored twice on the power play after getting blanked last night; Brendan Ranford had two goals and an assist to pace the team; and the team weathered a first period storm to give themselves the chance to win. However, it was overtime that once again bit Texas, which fell to 2-9 in the extra session this season. Their nine overtime losses lead the league in that regard. Laxdal continued, "We don't get a lot of bounces in overtime for some reason." Jack Campbell got the start in back-to-back games after Jussi Rynnas took a shot in the hand earlier in the day and couldn't go. Laxdal called Campbell's effort 'solid' and pointed out that his goaltender kept the team in it as he saw a lot of rubber in the first. Toronto opened the scoring late in the first after jumping out to a 7-1 shots lead. Petter Granberg got his first of the year and Toronto finished the frame with a 13-6 shot lead. "We didn't have a great first period," said Ranford. "They were on us really quick, and we didn't reach the level of compete they had in the first period." Ranford and team got on the trot in the second and outshot the Marlies 11-7 in the middle stanza. Derek Hulak slid the puck out to Jyrki Jokipakka at the point, who found Ranford in the slot for the power play goal. The assist for Hulak extended his point streak to six game, a team-high this season. Coach Laxdal commented on the power play in post game, "We made a few adjustments in game, and we did a good job shooting the puck. We'll keep working on it." Ranford emphasized the point on shooting the puck, "The biggest thing was getting shots through and on net. Our main mentality was to get the shots on net and create a second scrum." Toronto and Texas combined for four goals in the final frame. Brendan Mikkelson regained the Marlies' lead at 2:22 but Brendan Ranford answered right back with a backdoor roof shot on the doorstep of Christopher Gibson's net. Five minutes into the period, Jyrki Jokipakka scored from the point on the power play and it looked like Texas had a shot at the full two points. Toronto would even the score late on a shot that Laxdal called a 'cannon' from Matt Frattin. The winger's tenth of the year, which came just as Gord Dineen was pulling Gibson for the extra man, sent the game to overtime. The Stars' best opportunity of the power play came as Gemel Smith slipped a pass over to Julius Honka off the rush. Honka fanned on the pass and didn't get all of it. Laxdal said Smith is the type of player you want out on the ice in OT despite his rookie status. His offensive upside is big in that situation. Stuart Percy was the OT hero for Toronto though. His first goal of the season was the game winner. A bad defensive change and a turnover by Texas created a 2-on-0 for Percy. He shot the puck and beat Campbell for the 4-3 final. The Stars stay in town to play Rochester on Wednesday. The last time Toronto lost in regulation, it was to the Texas Stars. That was on December 20th in Toronto. Since then, the Marlies have reawakened their playoff chances by going 4-0-3 to drive themselves to 34 points and 11th place in the West. Overall, they are still playing below-.500 hockey, but tonight's game could change that. If they win, they will move to 15-15-6 and within striking distance of Texas, just two points back. Toronto will roll into town with plenty of rest. While Texas played last night, the Marlies haven't hit the ice since January 3rd. The agme starts a five game road trip that will swing through Texas and Charlotte before landing back in Ontario for a home-and-home against Hamilton. The Stars need to erase their memories of last night's game and concentrate on the two point at hand against the Marlies. The Stars have won both matchups against the Marlies this season, both by 3-1 final scores. Another 3-1 victory would be a nice final for the club after dropping the Iowa game last night. The Stars lost a step on 8th place Chicago, who now have 40 points in 35 games to the Stars' 38 in the same span. Two Texas mistakes came back to bite them as the Stars lost to the visiting Iowa Wild by a 2-1 margin at home tonight. Both Wild goals came off miscues in the Texas zone that put the puck on the stick of a visiting skater. "Iowa worked hard, but two turnovers cost us goals," said Coach Laxdal. "If you take those out, you'd probably like the result of the game. You can't make that critical mistake." The Stars appeared to be rolling great guns in the first period, taking aim at Johan Gustafsson nine times before the Wild registered a single shot on Jack Campbell. The Stars scored an almost inevitable goal just five minutes into the game and looked like they were going to roll through the contest with the way they came out of the gate. "We got some great looks but we're trying to look for the pretty play." Despite a 15-8 shots advantage after twenty, Texas only led 1-0. It would be their only goal of the game. Laxdal continued, "I want to see the trigger pulled quicker. We're waiting too much and when we do get a shot through, we hit the guy on the net-front screen." The power play did not connect despite five chances and fell victim to looking for that pretty play at times. "If you take that extra second, things close pretty quick," said Derek Hulak, who extended his point streak to five games with an assist. "There was evidence of that tonight, myself included, where we have to be a half second quicker and take that first option to get pucks through." Iowa got the tying goal in the second period when Jack Campbell came out of his net to clear the puck and it was intercepted by a forechecking Iowa skater. Campbell got to his net and rebuffed the first bid, but Stu Bickel scored on the ensuing scrum for a 1-1 tie. Gustafsson stood tall in the final frame for Iowa to hold the Stars at bay. The opportunistic Wild made it worth his while with a goal off missed Texas breakout pass. The pass up the middle was intercepted by Iowa and came back into their own net as Brett Bulmer got his second of the year. Texas was unable to come up with the equalizer to force overtime and fell to last place Iowa. The Stars will be in action again tomorrow when Toronto comes to town. The Stars rotated Valentine, Mangene and various forwards at wing on the fourth line. Defensive pairings were all over, but this is what warmups looked like. The Stars come back to the Cedar Park Center for the first time in 2015, last playing at home on December 28th of last year. When they return, it should be a hero's welcome from the home fans. Texas played giant killer on Tuesday against the Oklahoma City Barons and has a really good chance to cement themselves into the playoff picture with three home games against struggling squads. If the Stars are able to get six points, they will vault to a .594 points percentage, which would currently be good for 7th in the conference and just two points behind the pace for 5th. So Iowa is the first potential victim for the hungry Stars. They are still mired in last place in the conference, but it's mostly due to their start and less to their recent play. The team has gone 7-7-0-1 since last facing off against Texas. They've gotten to that record by trading wins and losses, never with a streak of wins or pointless games beyond two. The Wild will come to town depleted from their usual ranks with two of their top four scorers, Jordan Schroeder (10-14=24) and Jon Blum (4-12=16), and goalie John Curry all in Minnesota. Curry had been splitting starts with Johan Gustafsson. Josh Harding won't be the backup though. He hasn't played since December 6 when he 'suffered a dehydration episode' in that night's game and was hospitalized. On the Stars side, just when it looked like Texas was out of the woods on injuries, they struck again. Justin Dowling and Curtis McKenzie could return tonight from their respective injuries. However, Radek Faksa was in Dallas this week with his arm in a sling, and Branden Troock is out with a 'lower body injury' after slamming into the boards at high speed in the game at OKC. Eric Faille, who'll wear #17, will be stepping into the lineup to assist. The ECHL PTO is likely to play his first AHL game tonight on the fourth line.